Fixed star Etamin, Gamma Draconis, is a 2.2 magnitude orange star located in the right eye of the Dragon, Draco Constellation. The traditional name Etamin comes from the Arabic word التنين (At-Tinnin) which means The Great Serpent. Etamin was previously called Rastaban, now used for Beta Draconis, Alwaid. Both names derive from Arabic words for serpent or dragon. 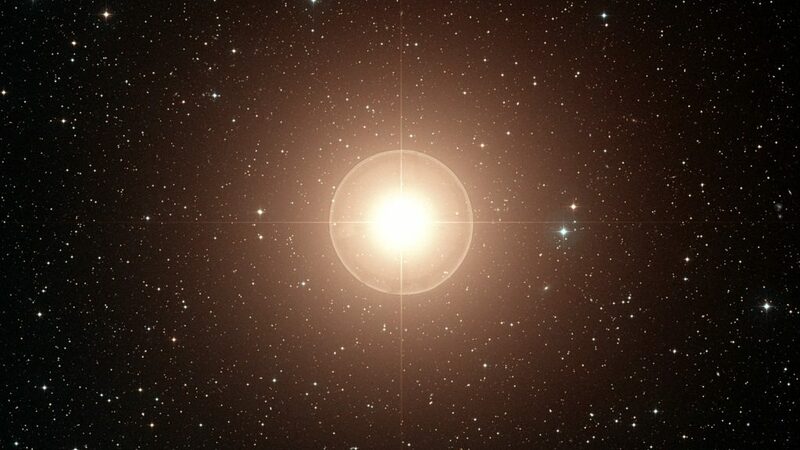 Despite its gamma designation, Etamin is actually the brightest star in Draco, with its 2.2 magnitude outshining the 2.8 magnitude Alwaid. It is close to the the zenith point directly overhead of London, so has earned it the name Zenith Star. Etamin was worshiped from at least 3500 B.C in Egypt. Its was visible through the central passages of the temples of Hathor at Denderah and of Mut at Thebes. At Thebes in Greece, the City of the Dragon, a temple was aligned to this star Etamin around 1130 B.C. 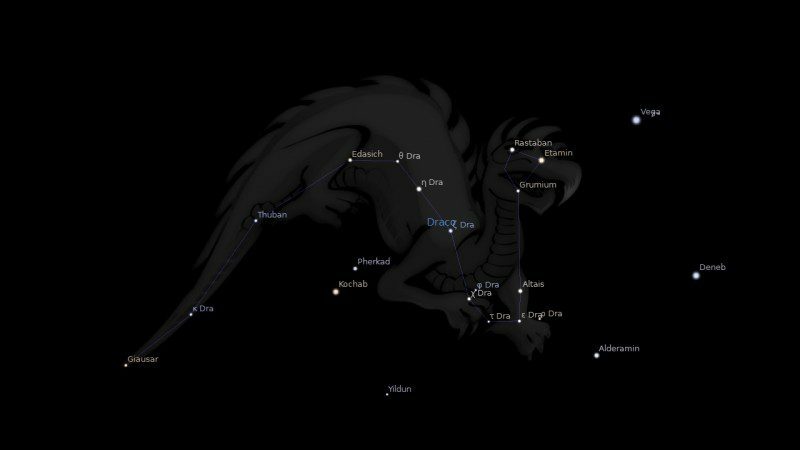 In the narrow longitudinal space between Aculeus and Acumen is the star Etamin, γ Draconis, chief star and one of the eyes of Draco the Dragon Constellation, and it may well be that it was this one which caused the other two to be so much associated with eyesight. But Etamin seems not to have been noticed by Ptolemy. 1. Fixed Stars and Constellations in Astrology, Vivian E. Robson, 1923, p.43, 194. 2. Fixed Stars and Judicial Astrology, George Noonan, 1990, p.10. 3. Fixed Stars and Their Interpretation, Elsbeth Ebertin, 1971, p.70. 4. The Living Stars, Dr. Eric Morse, 1988, p.87, 159. 5. Draco, the Dragon, Star Names Their Lore and Meaning, Richard Hinckley Allen, 1963. How can this be interpreted ? With planets not mentioned in the articles, I would just refer back to the general interpretation. I am curious what your thoughts are on the galactic center which is at 26 sag. My ascendant is conjunct the gal center exactly and I have found little information on the Internet. Supposedly it is the “sun of our sun” sort of influence and I imagine this point to have a quite significant effect, perhaps even more than most stars. Just curious about your thoughts on the matter and if you have found anything within your practice to be of significance. I have wondered about this too Michelle. I think Phillip Shedgewick is the only astrologer who has written about it. I expect it will have influenced the nature of this fixed star and ones close to it. So I would simply follow the interpretation for Etamin. ….Sun conjunct Galactic Centre in Uri’s case, and the other two too, i would think. Dont be afraid to punt this one Jamie, we need GC astrology info to complement the Jupiter transit in 2019. Its ringing our bing bangs, gamma ray bursting our innards, and white holing the economy.